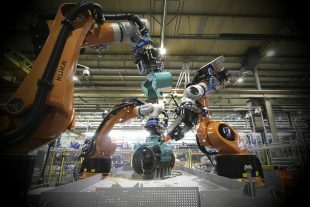 The robots for Sellafield’s Box Encapsulation Plant (BEP) are adapted from other industries. Cleaning up nuclear sites can take a long time and often means working in hazardous and challenging environments. We need to make sure that the UK’s nuclear legacy is cleaned up in ways that never compromise safety and always offer value for money. which can then reduce the time and cost to tax-payers of decommissioning nuclear sites in the long-term. We recognise that there is a huge amount of robotics talent in various UK industries and universities with enormous potential for use in nuclear. We want to harness this expertise and its potential for innovative use in decommissioning. Research and development has an important role to play in helping to address our unique and often complex decommissioning challenges. Robotics research and development is an exciting and rapidly developing area. We are currently exploring the potential benefits it could bring to our decommissioning programmes. Collaboration is important. Technology providers (academic and business) need to work with people on our sites who understand the challenges we face. Collaborative funding is also important. We work with InnovateUK and Research Councils UK to ensure funding is maximised to support more innovative projects through to deployment. Robotics are used in many sectors, so it is important we learn from that expertise and recognise that any developments we support may have application in wider markets, including internationally. We are now starting to see that projects that we funded a few years ago are going to market, and the final solutions are starting to be used on our sites. Sign up to our e-bulletin to find out the latest information from NDA. We will be announcing details shortly of a competition for innovative robotic technology. Monitoring the radioactive contents of both modern and historic storage ponds presents an important but difficult decommissioning challenge. 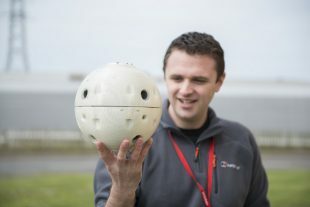 A number of remotely operated vehicles (ROVs), each with different characteristics, are now under development for use at Sellafield. One example is the AVEXIS-Mini, an underwater robot designed for mapping and real-time monitoring of pond waste. It was developed through collaboration between the Site Licence Company (Sellafield Ltd), a University (Manchester), and an SME (Forth Engineering). The AVEXIS-Mini addresses a variety of scenarios and can carry different on-board sensors. This mini-ROVcan be deployed through existing access points of only 15cm in diameter, allowing access to challenging contaminated areas where there is limited information. The flexibility of the design is facilitated by 3D printing which allows a quick, inexpensive way to produce prototypes of the AVEXIS-Mini. 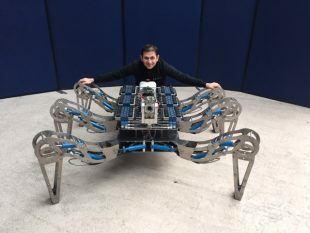 From a small spider-like beginning several years ago, a larger robotic cousin has emerged that can step delicately round obstacles or climb over them. Whilst still at the development phase it is intended that while on the move, Latro the robot spider will grab waste, chop it up and drop the remains in a skip. Boasting a full range of smart sensors, camera equipment, laser scanner and smart software, Latro will navigate over rough terrain using its own internal sensors, relaying back information to the remote operators via live 3D imaging. Its stainless steel legs are strong enough to carry a person, while its head is bristling with circuit boards and electronic gadgetry. Eventually, it will walk under water and retrieve radioactive material from some of Sellafield’s most hazardous ponds. Latro is part-way through a journey to acquire more technical capability. Its creators at Forth Engineering in Maryport are working with the University of Manchester, with advice from Sellafield, and are funded via a Knowledge Transfer Partnership through InnovateUK and the NDA. Challenge: Provide a cost-effective way to survey and retrieve materials from difficult-to-access areas, including underwater areas in legacy storage ponds at Sellafield. KTP helps businesses innovate and grow by linking them with a university and a graduate to work on a specific project. Each KTP is a three-way partnership between a business, an academic institution and a graduate. The academic institution employs the recently-qualified graduate who works at the company. The graduate, known as the ‘associate’, brings new skills and knowledge to the business. This archived webinar is from last year’s NDA PhD Bursary call, managed by National Nuclear Laboratory (NNL). It offers guidance to prospective applicants on the relevant themes in the decommissioning category, including robotics and autonomous systems. We sought proposals for entry into difficult to access and or/contaminated environments to perform inspection, characterisation and to carry out decommissioning activities. This could include size reduction, dismantling, waste segregation, general waste handling and assessed man entry.